Liverpool has beaten ManUre once more. 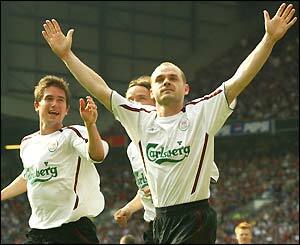 The score was 1-0 with Danny Murphy scoring from the penalty spot. Arsenal is king of England. At least for the time being. Liverpool is nowhere near being king. Gloryhunters. Support a proper team like Brighton and Hove Albion in the dizzy heights of the 2nd Div. Leicester City forever you peasants! !